One of my favorite things to find when I am in the mood for a new project is a knock off pattern of an expensive or trendy piece to go in my closet. I was super excited when I was scouring Pinterest one day and I found that lots of folks think like me and there are many knock off patterns out there with brands like American Apparel, Anthropologie, J. Crew, and more. If you are trying to look like a million bucks (or have your kids and loved ones look like it), but not spend it, here are some free knock off patterns to get you started. Make this awesome Anthropologie dress knock off for your little one (and an adult version, too) with this free Anthropologie dress knock off tutorial from Craftiness is not Optional. This J. Crew Metro Dress Knock Off from Shwin & Shwin is just so sweet. I love the extra little details and it really looks like the dress it is inspired by. 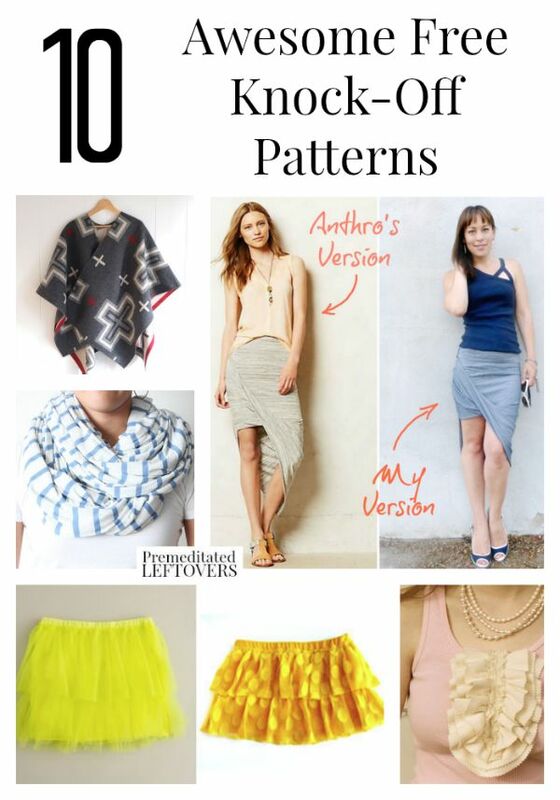 Domestic Bliss Squared has an awesome Anthropologie Oblique Pencil Skirt Tutorial that is so awesome. I love the way this skirt looks! And she says it only take 30 minutes! iCandy has an Urban Outfitters Ecote Dress Knock Off Pattern for free on her site. It seems like a simple dress to make for beginners. Ruffles and Stuff has a LOFT Inspired Ruffle Tank Top that you are sure to love since it's an upcycling project and can be made in under and hour. Check out this Kid's J. Crew Knock Off Ruffle Skirt from My Life: A Happy Circus. This Strapless Blue Dress is a GAP inspired pattern from Kojo Designs. I think it looks like a good versatile casual dress for summer days or paired with a cardigan for cooler months. If you love H & M, you will love this H &M Knock Off Shirt to Dress Tutorial from Lil' Bit Beth. It's upcycling and a pattern in one. Since autumn is upon us, why not make this SJP Knock Off Wool Cape with this tutorial from Sew Mama Sew? One of my favorite accessories is a circle scarf and this American Apparel Circle Scarf Knock Off from Come On, Ilene! is easy to make.